Bike rentals Cinque Terre. Let Cycle Classic Tours arrange your road bike rentals or e bike hire before you start with your cycling holiday around Cinque Terre in Italy. Book your road bikes or e bike hire online, its easy and convenient. 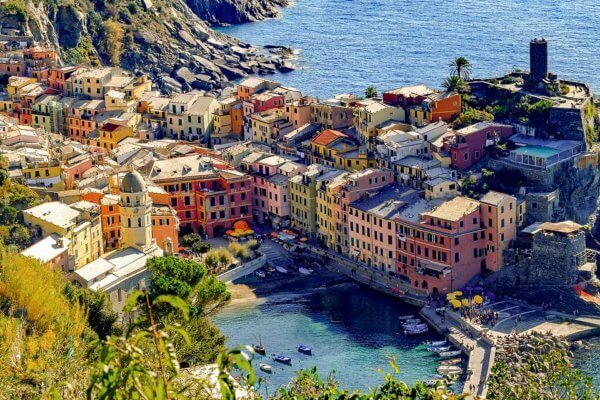 The Cinque Terre is a string of five Italian villages perched high on the Italian Riviera. The Cinque Terre is well known for its beauty and colourful buildings along with the wonderful nature. If you don’t mind really steep and long climbs with your bike, then you are on the right place. During your cycling trip you will find medieval villages, colourful buildings, vineyards and coastal routes. Cycle along the Italian coastline and discover the five towns of Cinque Terre. It is almost always good weather and there is little rain. Both professional cyclists and amateurs visit this beautiful region to do training sessions. Why Cycle Classic Tours Bike Hire is the best? EASY & FAST BOOKING – Book your bike rental bike in quick and easy. QUALITY BIKES – All partners Cycle Classic Tours using solid and maintained bikes. A good working bike is the determining factor for a successful bike tour. BEST OFFER & PRICE – Good quality for a fair price; that’s where Cycle Classic Tours bike rentals stands for! We wish you a pleasant cycling holiday on Cinque Terre.